Article Reviewed: Glynn RJ, Danielson E, Fonseca, FA, et al. A Randomized Trial of Rosuvastatin in the Prevention of Venous Thromboembolism. N Engl J Med 2009; 360. 17,802 participants were randomized to receive 20mg rosuvastatin or placebo. Follow-up visits occurred every 6 months and the assessment included clinical symptoms of DVT and PE. It is important to note that the median follow-up period was only 1.9 years, as the JUPITER study was terminated early due to a clear benefit in the treatment arm. Baseline characteristics were similar among treatment groups. Once again, participants were overall healthy but with elevated hsCRP levels. DVT and PE were classified as unprovoked or provoked based on whether or not the patient had recent trauma, hospitalization, surgery, or malignancy. Below are the results. Symptomatic DVT or PE occurred in 94 participants (34 in the rosuvastatin group and 60 in the placebo group). From a total of 17,802 participants, these events are few in number, although significant (p=0.007). Provoked versus unprovoked events showed a similar pattern. From this fact, we would infer that rosuvastatin has a consistent protective effect regardless of whether the event is "expected" or not. In other words, it strengthens the case that rosuvastatin has potent enough effect on the endpoint to prevent even a provoked VTE. The number needed to treat (NNT) during this study (median follow-up 1.9 years) to prevent one episode of VTE was 342, which was not calculated in the article. This NNT confirms that, although significantly different, the number of VTE in both treatment and placebo groups were small. The occurrence of PE was not significantly different among groups. This may be attributable to the close follow-up visits or diligent adverse event reporting among patients. Theoretically, DVT in these cases may not have had the chance to progress to PE. Even though few, the occurrence of VTE was similar to the rates of MI and stroke in the previous JUPIER publication. The NNT over 5 years for the cardiovascular endpoint alone from JUPITER was reported as 25. The authors of this analysis chose to combine the CV primary endpoint with VTE to show treatment benefit. The NNT for this composite endpoint was estimated as 21. Only symptomatic VTEs were documented in this study. VTE is common and often asymptomatic, so the frequency reported in this study may have underestimated the actual rate. The participants in this trial were healthy individuals with no pre-existing cardiovascular disorder, but with an hsCRP = 2.0. Since even provoked VTE seemed to be prevented by rosuvastatin, a trial of this sort involving more confounding variables, but still randomized, may show an even stronger effect of rosuvastatin on VTE prevention. The JUPITER data set is large, and investigators were able to show a significant reduction in VTE event from rosuvastatin 20mg daily. Several mechanisms of action for this finding are proposed, including reduced tissue factor expression and activation of factors V and VII through intracellular signaling pathways. As this study just dealt with a single dose of 20mg, it will be interesting whether further studies are able to show a dose-response relationship. While the use of a statin for the sole purpose VTE prevention may not be justified at this time, we can include VTE prevention as another item in the growing list of benefits to statin therapy. Glynn RJ, Danielson E, Fonseca FA, et al. A Randomized Trial of Rosuvastatin in the Prevention of Venous Thromboembolism. N Engl J Med 2009; 360. Ridker PM, Danielson E, Fonseca FA, et al. Reduction in C-reactive protein and LDL Cholesterol and Cardiovascular Event Rates after Initiation of Rosuvastatin: a Prospective Study of the JUPITER trial. Lancet. 2009 Apr 4;373(9670):1175-82. 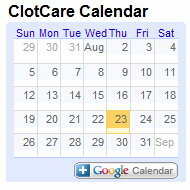 *ClotCare guest author Lance Ray, Pharm.D.